I had visions of starving at Walt Disney World dancing in my head. Hello again. I'm back for another post & this time we're back to my closest trip, Disney with Kristin. I love to take friends to WDW. It's one of my favorite things. Whenever I go with friends I force them to make all the decisions. Now, before you start thinking how sweet I am, let me just put this out there, I'm not. Don't let this fool you. It's not that I'm a good friend that I let them make all the decisions, it's out of sheer selfishness. I hate making decisions(majority of the time). So this is totally a selfish thing. I know it works out well for both parties, but I still can't have you all go on thinking I'm a nice person or anything. (that would really mess up a lot people's opinions of me) This has always worked out well. I take friends to WDW, they make the decisions, everyone's happy... until now. Kristin is probably the closest thing I could ever have to a twin, other than my mom of course. In most ways we are a lot alike, except for the fact the she is a people person & I am beginning to believe I have a sever allergy to most of the human race, but that's for another blog. Kristin & I share the defect in decision making- we don't like to do it. The joke lately has been that once Kristin & I arrive at WDW we're gonna have to "phone a friend" to decide for us on anything from which ride we should do next to what snack we should try. Seriously, we're in trouble. Last post I told you how the trip came to be and where, most likely, where we're staying. Next thing to plan for this trip was dining. We had two options. The first option is to just do the "Quick Service Dining Plan", This is a value. For $32 per person per day you get to have 2 "quick service" meals, 2 snacks per day, plus a resort refillable mug. The resort refillable mug is a travel mug that can be filled with any beverage (milk, coffee, soda, etc) for free at your resort for your entire trip. The "quick service" meal is Disney's glorified version of "fast food". 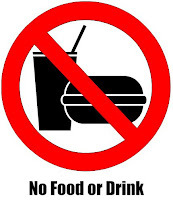 Now before you think that if we pick this plan we'll end up coming home with souvenirs of the clogged arteries & sleep apnea variety... think again. This isn't Universal Studios people. This is Disney World... this is Disney World with President Bob Igor- Vegan. Gone are the days of trans fats, no more white bread hot dog buns, buh by on property McDonalds. Yuppie moms all over the country cheer with glee, throwing their organic, all natural products in the air. This is a new day in the Disney Dining World & to that I say, BOOO! I go on vacation to let loose & eat whatever I feel like, not stick to the healthy eating plan I maintain while at home. If I want to eat my hot dog on such a terrible, vile thing like a white bread hot dog bun, that's my decision! Last I checked white bread wasn't killing anyone. I digress. Now I don't want to be giving the idea that the food isn't good, 'cause that is not the case. There are a ton of options for us, from the American standard & personal favorite (read: obsession) cheeseburgers & fries to the homemade pork chop, red skin mashed potatoes & carrots. We will not go hungry. The snacks are anything $4 & under. So with our snack credits we could buy ourselves the most expensive 8 oz of water in our lifetime (aka bottled water) or soft pretzels, popcorn, ice cream, SCHOOL BREAD (more on that later), pastries at France (meh), funnel cake, chips, soda, main street bakery's cinnamon bun (so good! ), even that colorful stuff that I only see while at home (fresh fruit & veggies) etc. The sky's the limit. So that was our first option. Our second option was basically the standard dining plan- 1 quick service, 1 snack & 1 sit-down restaurant per person, per day. That plan would cost us $42 per person, per day. This plan exchanges the first plan's second quick service with a sit-down meal instead. This plan, again, is a good value- for Disney World that is. I spend $80/six weeks on groceries at home. Again, I digress. This option is good to get more of the Disney Theme that are in the restaurants, but can slowdown the theme park enthusiasts. So I sent Kristin the basic info letting her decide which would be best. Again, I'm not gonna make the decisions, plus I have been to WDW, oh 15+ times. Been there done that. Tough decision, I know. What did she choose you ask. She didn't. About a month went buy without a firm decision, so this time I sent a quite detailed e-mail, complete with links to every WDW menu known to man (www.allearsnet.com) to help her decide. While she read over that e-mail I fasted, prayed & even went to do the disney dining rain dance, but thankfully it didn't come to that. Kristin made the decision. I'm so proud. We are going with option A, the quick service dining plan... as of now. I have kept the door open to Kristin to change her mind up to the week before, when I have to put the dining plan on our reservation, to change her mind. Going with the idea that we hate making decisions, I'm pretty sure we're not gonna see a change with this, BUT you never know. God does great things in the area of deliverance. However, I don't think Teresa C will be visiting from now to May, so anti-decisions should still be our trip's theme by May. In honor of our big step in making our first decision (okay so Kristin made it, but I'm totally taking credit for it, because I can. The perks in having your own blog. No fair & balanced here... total slant in the pro-Lisa movement.) I will now post a pic of my favorite snack on Disney property. I would take a flight to Florida just for this item. 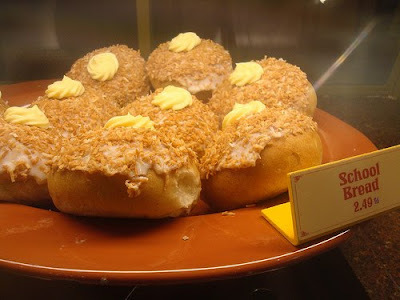 It is from Epcot over at the Norway pavilion's bakery, Kringla Bakeri og Cafe. I know you may be thinking, "...but Lisa wouldn't France's bakery be better?" *insert sarcastic snicker* What do the French know? Their bakery serves eclairs with chocolate in the middle. Um, I know they may have created the eclair, but clearly, America improved upon their weak attempt. Norway's bakery is much better & the busiest bakery in Epcot. So head to Norway to buy yourself "the best thing on the planet". It's also called, school bread. This stuff should be illegal. It is like a very light bread, filled with custard, frosted on top, rolled in toasted coconut & topped with another dollop ( love that word! that & shellack. Great words) of custard. Now I'm not a huge sweets person, I'm more of the steak & potatoes kind of guy. Yes, you read that right, my appetite & taste is more guy than girl. Steak, junk food & fast food are my main food groups & this is why I diet 90% of the year. This however has got to be the best thing I have ever eaten in my life and if you are ever in Epcot or the state of Florida, head straight for the Norway bakery & have a school bread. My fee for this wealth of knowledge, you must bring me back one. They have to go boxes, believe me I know. My favorite resort the Boardwalk, you know the one we're staying at, is a 10 minute walk to the Norway Bakery via Epcot's back entrance, International Plaza. Yes, there is a back entrance to Epcot. You'll hear more about that later. Now with the close of this blog, and without further adieu (take that France, killing them with kindness), I give you school bread. Warning- Read at your own risk. It's a long one! Notice those five days straight at sea. Those five days we will be in the middle of the Atlantic Ocean with no land in sight. You may be wondering, "What is she thinking?!". I am too. Five days straight of nothing but ocean & my parents, my 60+ year old parents. It's gonna be five days of, "Don, where'd you put the pool bag?" "I didn't touch the pool bag, Rose." "Well, I don't have the pool bag." "Well, I don't have it. Where's the last place you had it?" "I gave it to you." "No, you didn't." "Oh, here it is... on my shoulder." "You know Rose!" This is why I splurged & got my own cabin! I love my parents & there's no one else I'd rather be on this trip with, BUT they do make you go a little nutty at times. So that is part one of this trip, the bigger part. Now for part two. After we booked this cruise. The next step was figuring out how to get over to Barcelona, where we'll be taking the ship from. Looking into the airfare was shocking. Direct flights from JFK to Barcelona was painful, in the $2,500 each range! Now up to this point the trip isn't costing us anything but a $95 dollar booking fee- good ol' DVC. Still, to spend that amount of money on the airfare was outrageous. So I got over my prima donna phase (It comes out every now & then, I know shocking.) & began to look into the worst thing ever on the planet... connecting flights. Connecting flight are the worst, but international connecting flights are near torturous. Looking into the flights I found flying into Dublin, Ireland was the best. Then I found that if I booked a flight to Dublin and then booked a separate flight from Dublin to Barcelona on another airline it would only be about another $200. Score! The best rates I could find were to fly JFK to Dublin on Delta. Then Dublin to Barcelona on Aer Lingus, a cheap, Irish government owned airlines. I wonder if they have segregated seats, like the left side of the plane is for their version of Democrats & the right is for their version of Republicans? Gotta check into that... don't want to be on the wrong side. Anyhow, we had the flights figured out and decided to book the flights quite a few hours apart, so that we could take a quick tour of Dublin. After a little bit of research, we're staying in Dublin for 3 nights. That's quite the layover, I know. There is just so much to see in Ireland & we knew we'd probably never go back, since there is so much more to see in the world, that we decided to stay a few days & see Ireland's highlights. (Wow, talk about a run-on sentence. Mrs. New, my 5th grade teacher, would be irate!) So now we are flying out of JFK, nonstop (my inner prima donna won, but at a cheap rate so "we're" both happy), on Sept 13 & staying in Dublin Sept 14th-17th. Next, we always arrive for a cruise the day before. It's too stressful to fly in the day of departure, 'cause a delayed flight could mean your baggage not making it onto the ship, or even YOU not making it on the ship. So we'll fly out of Dublin on Sept 17th & arrive in Barcelona at 10:15am. We'll spend that day & night in Barcelona doing some sightseeing, then the next day get on our Home Away From Home for the next 14 days, the Disney Magic. So that's a quick rundown of the huge Europe trip for this September. Don't worry, I will be giving MUCH more details in the coming months. Then once there, this will be my main form of communication to back home. Hope you've enjoyed my random rambling so far. If you have & would like to hear more of it, make sure you click to follow me over on the right. The "cold-hearts" are going to Disney World! Well, this is the official start of my travel blog, travel journal, trip report, random rambling... whatever you want to call it. I feel so blessed that I could have the first official trip on here be with Kristin! Kristin & I will be going to Disney World May 10th - 17th, 2010. 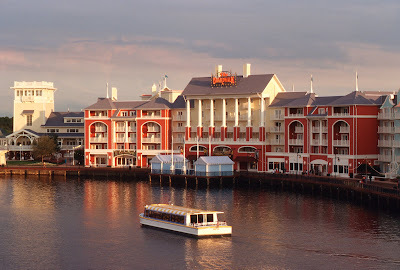 As of now we're staying at my favorite Disney Vacation Club Resort, Disney's Boardwalk Resort. All two of us are booked in a 2 bedroom, 2 bath villa, complete with living room, kitchen, laundry room & whirlpool tub! Have I mentioned I love being a DVC (disney vacation club) member?? I say as of now because I have us on the wait-list to stay at Disney's Beach Club Resort. This is one of the Disney Vacation Club Resorts I have not stayed at yet & it has the COOLEST pool. It's right across the lake from the Boardwalk, so we'll still have the great location, but the addition of a really cool pool. So I'm hoping we'll get moved to the Beach Club, but if we don't we'll be "stuck" at my favorite resort in a two bedroom villa... poor us. While we're there we'll get to see Epcot's International Flower & Garden Festival. This will be my first time visiting during the Flower & Garden Festival. I've seen many pictures of it, so it's something I'm looking forward to seeing in person. This is my first post on my new travel blog. I set up this blog as a travel journal for myself, but with the added benefit of sharing it with you, my family & friends. I hope you enjoy reading it as much as I enjoy writing it. :) Really, I have no clue what I'm doing. I'm figuring out this whole blog thing as I go, so bear with me. Now that you understand my travel obsession, let me fill you in with what to expect from this blog. I will be updating this blog throughout the planning stages of my trips. Once on my trip, this will turn to a travel journal, so that you can hear about all the craziness that happens to me & my travel companions while on these trips. Like for example, when I was in Egypt and they were trying to buy me for some camels! Yeah, really happened- twice actually. The second time they threw in a donkey too! (If I ever wonder about my self worth I now can remind myself that I am at least worth a couple of camels & a donkey. Good to know) I find that once you get home from a trip you really forget a lot of the little things that happened on your trip that made it so memorable. That's what started me on journaling my trips. This is also for the wonderful people in my life who join me on these trips. Most of them live far from me & I want them to feel as though they are a part of the planning stages, my favorite part. Also, this is to get them excited about their upcoming trip. Now for the trips. I have three big trips coming up with some awesome people! First, in May I'll be heading to Disney World with one of my best friends, Kristin. 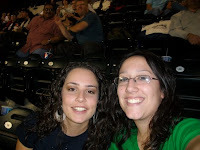 You know Kristin is a good friend of mine- 'cause she's a Yankee Fan. That fact alone proves that love does transcend all! Kristin is a big pranker & quite cold-hearted(inside joke, that you'll hear a lot) like me. Needless to say we get along great! This will be a fun trip... to say the least! Next is my huge trip throughout Europe in September. When I first started talking about this trip most people thought I was doing this trip on my own. Um, yeah. Anyone seen Taken? I don't think so. My parents are coming along on this trip as a celebration of their 40th Wedding Anniversary. This trip has been in the making for almost two years. I can't believe how close it is! There's a lot of details coming for this one, 'cause as I said- it's huge! Highlights include: Ireland, Spain, Gibraltar, Portugal & more. Finally, my last big trip is back to Disney World in December, with another one of my best friends Dyanna. Yes, this will be my second trip to Disney in the same year & if you think that's odd, you obviously don't know me that well & it's probably a good thing that you're reading this blog. We'll be there for all the Christmas festivities & I can't wait! We're even going to try & get on the Christmas Day parade taping with Regis & Kelly. Should be interesting. This trip will be my two favorite things, Christmas & Disney World all put together. Plus, when Dyanna & I get together it's nonstop laughter, now add in the fact that we'll be at the "happiest place on the earth"... yeah, it should make for an interesting trip. So I think that's everything for now. Next up you'll be reading about my trip with Kristin. Also, I'll start with some Europe details. Did I mention that this trip is going to be huge?